Where Paul’s poor, they’re high rollin’. Where Paul’s dumpy and bald, they’re well dressed and have perfect teeth. And where Paul’s ministry is modest, dull even, they’re overflowing with charisma, with pizazz. And where Paul’s quiet and reserved, they are known for ecstatic, mystical experiences. The assumption, of course at the heart of this is that God shows God’s power in a certain way. You should respect people who are successful, because God’s gifted them with success. You should listen to people who are physically attractive or impressive, because God has blessed them with beauty. You should defer to, and revere people who’ve had powerful spiritual or mystical experiences, because clearly, they’ve been given some kind of knowledge or divine favour you don’t have. In the end gives the Super-Apostles credibility. And limits Paul’s. It’s not only the basic assumption the Corinthians make, it’s the basic assumption at the heart of most belief systems, whether secular or sacred. That we either achieve favor with God, the universe, or the transcendent through our achievements, our ability to climb to the top of wherever we’re at. Or that we are somehow divinely favoured from square one, and are given the gifts of success, power, or influence as outward signs of that divine favour. Whether it’s something like obtaining good or bad karma, following all the commandments, or holding the right set of beliefs or fully understanding the market, there is some form of spiritual law at play. Greatness of one kind or another is the outcome of either divine favour. Or divine reward. Of course, our actions influence the outcome of our lives, for better or worse. It’s true. But that’s not what God is all about. At least not according to this morning’s scripture passage. Remember that Paul’s getting edged out by these impressive, powerful Superapostles. And you’ll remember that this passage, the whole letter is the defense of his ministry. It’s his chance to show his strength, his divine favour. Once and for all. First, he says something to the effect of “I know someone whose had those mystical experiences.” Now scholars are pretty much certain that the person Paul’s talking about is actually Paul himself. Why? In doing so, Paul was taking the advice I received in my introductory preaching course: never make yourself the hero of the sermon. He won’t make himself the hero of even his own spiritual experience. It’s tacky. Been there, done that, he says. I could boast and brag about it all day. But like I said—it’s tacky. But there is one thing I’ll boast about, Paul says. I’m not gonna boast about how amazing, how blessed, how spiritually mature, or how strong I am. Believe me, I could. Instead, I’m gonna brag about my weaknesses. Weaknesses, not strengths. Now the first weakness he brags about is something he calls his “thorn in the flesh.” Scholars have debated back and forth what this thorn actually is. In truth, nobody knows what he’s specifically talking about. But we do know is that something happened to Paul, or he encountered an obstacle that held him and his ministry back. It blew away the life he always envisioned for himself. We don’t know what it was exactly, but it turned him in to a failure. It caused him deep suffering and despair. Like a sharp stick in the side. He prayed day after day for it to go away, and for things to get better. To be returned to his former stature and glory. But it never happened. He prayed and prayed, and God never took it away. “My grace is sufficient for you,” Says God. “My grace is sufficient, for power is made perfect in weakness.” Paul was consumed with his suffering and pain. He wanted to be great, he wanted to be successful. He wanted to be strong. But God told him that it wasn’t his strength he’d use. But his weakness. After hearing that, Paul began to see this thorn in the flesh not only as an obstacle, but as the catalyst for something good. Now let’s be clear: The thorn isn’t something that God gave him or made happen to him. He says it was given to him by a “messenger of Satan.” This isn’t scripture saying that God is the cause of our suffering, or that everything happens for a reason. And really, he’s just following the pattern of Jesus on the cross: that God would take something so vile and terrible and transform it into an source of blessing and new life. So despite the fact that by history’s standards Paul’s an extreme underachiever, God took his failure it and used it to transform him in to an agent of God’s mercy and love, spreading the Good News far and wide. And we’re still talking about him today. And for Paul, that’s the only this worth boasting about in the end. It isn’t made manifest in strength, favour or reward. But God’s power is revealed in the cross of Christ. God’s power is in bringing light out of darkness. God takes death and uses it to bring new life. Resurrection. God’s power is made perfect in weakness. Who here remembers the “Napalm Girl”? It’s a famous photo from the Vietnam war that appeared in the New York Times in 1972. It’s a photo of Kim Phuc Phan Thi at age nine, fleeing from a napalm attack. One that killed members of her family and other civilians, burning off her clothes and leaving her with third degree burns. Growing up, Phan became consumed by intense emotional and physical pain. Not only was her body severely scarred, eternally itchy and heat, she was also imprisoned by despair for her situation and rage against those who did this to her. She wanted relief. She wanted peace, she wanted friendship—a cure for her loneliness. And one day she came upon a copy of the New Testament on a library bookshelf. She read through it, and became intrigued. In Christ’s suffering, she found her own. And so, on Christmas Eve that year, she found herself in a small rural Christian Church. Hearing the message of God’s gift of grace. Of unconditional love and transformation. And something in her shifted. Now, I am aware that some of us might struggle a bit with more evangelical sounding language. And for others it’s right as rain. But just listen. Listen to how she describes the next day. “When I woke up that Christmas morning, I experienced the kind of healing that can only come from God. I was finally at peace. And this experience ended up transforming her outlook on life, and empowered her to do things she couldn’t have dreamed of before. “My faith in Jesus,” she continues. “My faith has enabled me to forgive those who have hurt and scarred me. It has enabled me to pray for my enemies rather than curse them. And it has enabled me not just to tolerate them but truly to love them. I will forever bear the scars of that day, and that picture will always serve as a reminder of the unspeakable evil of which humanity is capable. That picture defined my life. In the end, it gave me a mission, a ministry, a cause. Phan went through terrible suffering and sadness, the kind most of us can barely even imagine. She was consumed by hatred and pain. Like Paul, she was given “thorn in the flesh.” One that pulsed with every step she took. One that wouldn’t go away. But, upon entering that church, like Paul, she heard the Word of grace. One so deeply resonant and powerful, that it ended up changing her life entirely. It didn’t erase the past. She still holds the memory, and her body still bears the scars. But God took this awful event, this crime against humanity, and used it to bring her healing, peace. And to transform her into an agent of God’s love and mercy, a bringer of Good News to a world. And that’s the Good News of Jesus Christ. The Good News is that life isn’t simply a big game of cosmic cause and effect. Of punishment, favour, or reward. God doesn’t cause our failings, sufferings, or failures. Nor does God snap her fingers to make them disappear from space and time. But God redeems them for good. God’s power is healing power. A power made perfect in weakness. Light out of darkness. Life out of death. God’s greatness is shown in our weakness. So, no matter who you are, you have failures. You have suffering, you have shame. Some of you were born into lives and families that held you back from day one. But the good news is that no matter how big the thorn in your flesh, no matter how deep the pain. You can let down your defenses. You can make peace with your failures. And you can let go of your hatred, your resentment and your shame. You can let down your defenses and let a new day shine in. Because a life of greatness still lies ahead of you by the grace of God. For in the barren soil of your brokenness and weakness lies the seeds of God’s power and God’s goodness. God can, God will, take those dead things inside of you, and out of them bring something sacred, something beautiful instead. Hear this good news. And let it heal you. Let it change you for good. 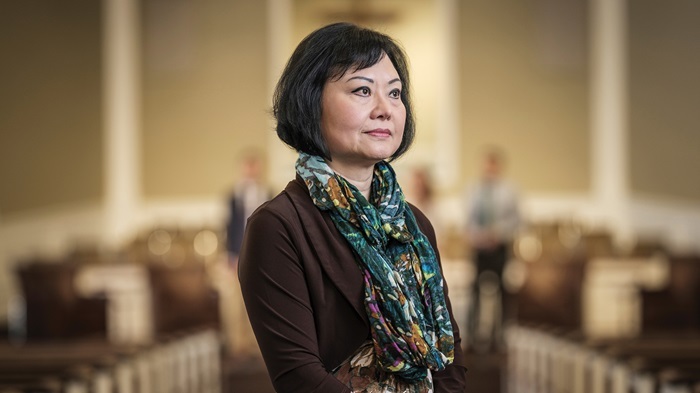 [i] Kim Phuc Phan Thi, “These Bombs Led Me to Christ,” in Christianity Today, April 20, 2018.